Garmin’s Approach G30 is a golf handheld full of pertinent information! 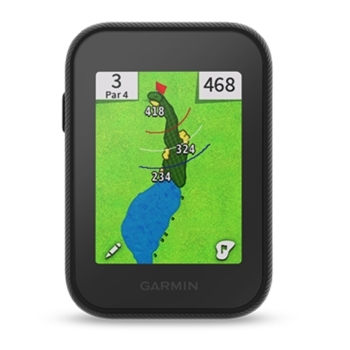 Preloaded with over 40,000 courses this compact 2.3” color display GPS unit enables the user to view the entire course map and offers touch targeting. Internal GPS, Smart Notifications, Hazards, Layups and More! A built-in high sensitivity GPS quickly acquires satellites to show hazards, doglegs, and distances to the green, ensuring accurate information for every hole. Working closely with the Green View function, you not only will be able to see the distance to the green but also the shape of the green which also allows you to place and move the pin to the correct location on the green to improve distance accuracy. Staying in Touch while on the course just got easier with Garmin’s Smart Notifications. Garmin’s G30 will alert you to incoming emails, phone calls, texts, and more when paired with a compatible smartphone. 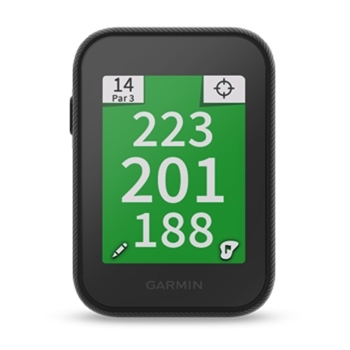 You can also easily keep track of fairway hits, putts per round, and greens in regulations with the Stat Tracking ability, which can then be shared within the Garmin Community when your smartphone is connected to the Garmin Connect App. 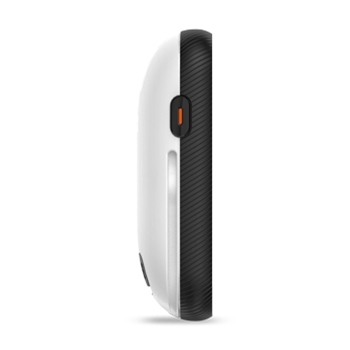 Rugged, Lightweight and with an IPX7 water rating, the G30 is a top choice for Golf GPS units. Working up to 15 hours on one charge, the g30 is sure to last a few rounds! Over 40,000 Full Color Courses with Mapping! Garmin’s Approach G80 Handheld Golf GPS with 3.5” sunlight viewable color display and slim design is a top choice on the course or at the range! Preloaded with over 41,000 courses this handheld shows ball speed, club head speed, tempo, and more on the range and will provide distance to fairway, hazard, or front, back or middle of green on course.